Sunday was supposed to be a range day. A CZ 75 B Compact was deftly packed in a bag along with some ammo, a bore-snake and a plastic Rifle case containing my prized Lee Enfield. No breakfast was served as SHE was asleep. I started my day with a mug of hot tea and a croissant. Fired the engine of my four-wheeler, put the bag in her trunk and the gunnie was off to the range. Fired a lot of lead that day, the brass alone must have been half a KG. At noon time with temperatures rising I planned to call it a day. That’s when snuggler called me on my cell phone and ordered a list of goodies to be brought ASAP. Yes sir! What’s can a man say other than the replying in the affirmative. So the GPS was set the nearest convenience store, the goodies bought, loaded in the trunk along with the guns and course set for home sweet home. My faithful, helped me unload the stuff and dexterously placed everything in the kitchen. Five minutes later he was giving me wry looks and a comical smile. With the same looks he asked me if Everything was to be placed in the refrigerator. The scribe lost in watching some old flick on TV nodded “yes”. A while later later he showed up with a bigger smile on his face and told me he had placed Everything in the fridge. What’s wrong with this man? I thought. Few hours later, I opened the refrigerator to find this radiator coolant sitting, staring at me. Lots of pondering, his wry smiles included, my decrepit mind deciphered this greatest mystery on Earth. 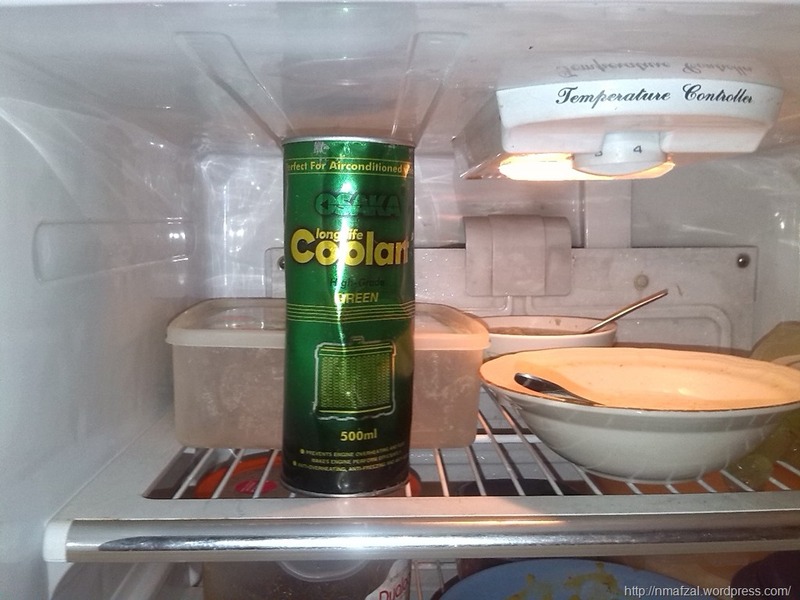 The man being pure illiterate, and thinking the bloated tin of radiator coolant to be a can of Beer had it snug tightly in the freezing environs of a but ageing fridge. I told the snuggler about it and we had a good hearty laugh. NextWhat are the benefits of 3G/4G netwroks for Pakistani consumers?